U.S. intel official confirms identity of "Jihadi John"
LONDON -- The knife-wielding masked ISIS militant seen in a number of beheading videos and dubbed "Jihadi John" has been named as Mohammed Emwazi, a London man with a college degree, a U.S. intelligence official confirmed to CBS News Thursday. Emwazi earned his degree from the University of Westminster, the official told CBS News. Both The Washington Post and the BBC reported Thursday that he was known to British security services by 2011 at the latest. Friends of Emwazi spoke to the Post on condition of anonymity, including one who said that they had "no doubt" Emwazi was the man who appeared in ISIS' execution videos. 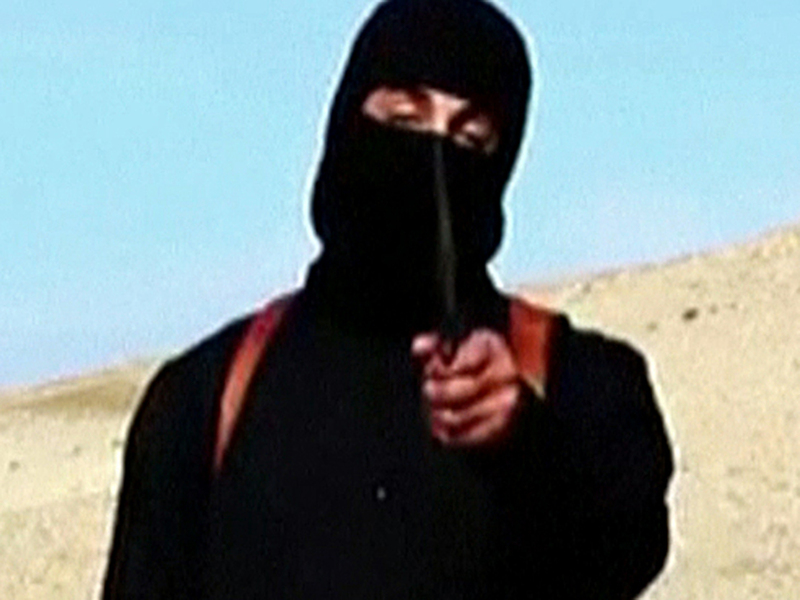 "Jihadi John" appeared in a video released in August showing the slaying of American journalist James Foley. A man with similar stature and voice was also featured in videos of the killings of American journalist Steven Sotloff, Britons David Haines and Alan Henning and U.S. aid worker Peter Kassig. The research director at a British human rights group also told the Post that he believed Emwazi was the man in the videos. "There was an extremely strong resemblance," Asim Qureshi told the Post. "This is making me feel fairly certain that this is the same person." At press conference Thursday, Qureshi told reporters that he couldn't be "100 percent certain" that the two men were the same. "The guy's got a hood on his head," Qureshi said. Qureshi said he came to know Emwazi in 2010, when he returned to the U.K. for a week to help his father after relocating to Kuwait. When Emwazi attempted to return to Kuwait, he was informed that the Kuwaiti government would prevent him from entering the country. "The Mohammed that I knew was extremely kind, extremely gentle, the most humble person that I knew," Qureshi said. Qureshi said his last contact with Emwazi was in January 2012. Later, Emwazi's family told Qureshi that he had disappeared after failing to make it to Kuwait one last time. Four months later, police told the family that they believed he was in Syria, Qureshi said. Emwazi's family wouldn't comment to the Post. Qureshi told reporters that the family wasn't sure whether Emwazi was "Jihadi John." No one answered the door at the brick row house in west London where the Emwazi family is alleged to have lived. Neighbors in the surrounding area of public housing projects either declined comment or said they didn't know the family. Neighbor Janine Kintenda, 47, who said she'd lived in the area for 16 years, was shocked at the news. "Oh my God," she said, lifting her hand to her mouth. "This is bad. This is bad." The White House wouldn't confirm what the U.S. intelligence official told CBS News. A spokeswoman for President Obama's National Security Council, Bernadette Meehan, said in a statement that the government wouldn't comment on the ongoing investigation into the deaths of the Americans. "As the president has said, no matter how long it takes, the United States will not rest until we find and hold accountable the terrorists who are responsible for the murders of our citizens," she said. Referring to ISIS by an acronym for the Islamic State of Iraq and the Levant, or ISIL, a spokeswoman for the U.K. Embassy in Washington told the Post, "Our prime minister has been clear that we want all those who have committed murder on behalf of ISIL to face justice for the appalling acts carried out. There is an ongoing police investigation into the murder of hostages by ISIL in Syria. It is not appropriate for the government to comment on any part of it while this continues." Emwazi's friends told the Post that they believe that a planned trip to Tanzania in May 2009 led to his radicalization. Emwazi and two male friends were detained by police upon their arrival in Dar es Salaam, stayed in custody overnight and were eventually deported, the Post reported. Emwazi then went to Amsterdam. According to emails that he sent to Qureshi, which were provided to the Post, Emwazi claimed that an officer there from the British Security Service, known as MI5, accused him of trying to go to Somalia, where the al Qaeda-linked terror group al-Shabaab is based. Emwazi claimed MI5 then tried to recruit him, the Post reported. The family of one of Emwazi's victims commented Thursday on the unveiling of his identity. Steven Sotoloff was beheaded by Emwazi in a video shared by ISIS. "The Sotloff family was informed of John's identity," said a family spokesman. "This is one step on a long road to bringing him to justice."